There are a lot of small differences between England and America. One thing I’ve been shocked about is that you don’t have the freedom to put your own milk in the tea or coffee that you order. But what if I want cream or skim milk…or half and half…? You either order it ‘white’ or ‘black’ no if buts whys hows whens about it. The first time I encountered this it took me by surprise. For the first time in my life I was bad at ordering coffee. There is a remarkable public transportation system in London. I’ve been taking the underground, the tube, everywhere. Every central station has a jenga-stack of lines that are stories and stories below ground. You can shoot all across the city in a flash. At each station you have to wait 3 minutes (at most) for a train. Why drive! Then above ground, if you want to see the sights there are busses on busses. In central London, there is at least one bus per block at all times. London’s made the buses iconic and stylish. It’s cool to ride them…unlike the buses in the U.S. Right now it seems like London has a pretty good handle on its water management and flood control. However, should water get passed the barrier at the mouth of the Thames and creep into the river-side stations, I fear that the slick tubular tracks of the underground will look more like sewers than transportation stations. The lines are sometimes so far underground that it would be a disaster to try to dry them out and get them up and running again. The underground lines are London’s arteries. They keep people moving and keep the city pumping. The tube has a daily ridership of about 3.5 million people. The city would shut down without it. In addition, London’s public transportation is really getting it going with bike shares and water buses. Dotted all over the city are bike hubs where you can take a bike for a pound or two (2 or 3 dollars) and drop it off at another bike station. You are charged a little extra if you take more than 30 minutes…and what happens if you get to a station and there are no open parking spaces? Nevertheless, it’s a good thing to try and it seems like it is going well. 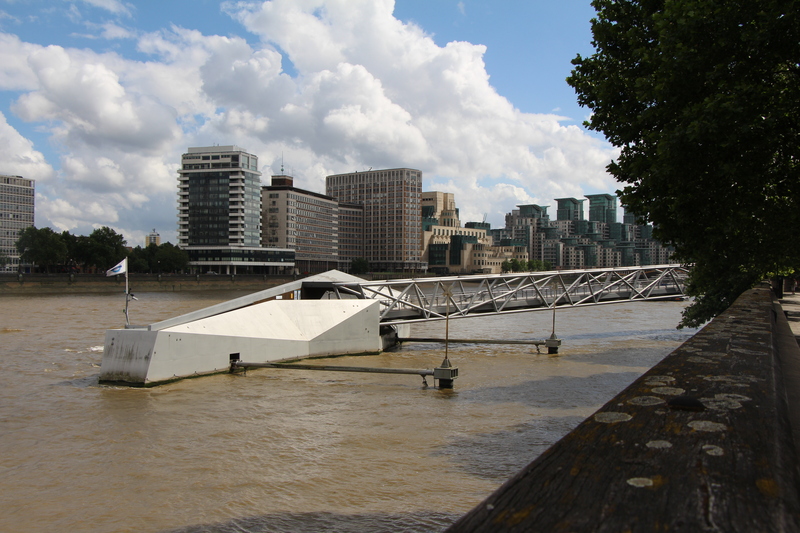 The Thames has really funky, nicely designed docks for the water bus that runs up and down the river. It’s a very convenient method of transportation for tourists and residents alike. Great views! Yesterday I spent the afternoon at the Tate Britain. I went to go see a painting exhibition, a retrospective of L.S. Lowry. Lowry was an English artist who portrayed the industrial landscape of North West Britain. For 40 years he painted urban landscapes and the life of its working class. His work shows men coming and going through factory gates, gathering around a street fight, or rushing to the ‘football’ pitch. I was pretty struck by the exhibit, his paintings told stories. Together, they tell us about a bygone era in England’s history. Between 1920 and 1950, Lowry left a descriptive record of life between the world wars that is even more accessible than any George Orwell book or history text. I then walked around the museum and sketched this. The whole time I was drawing I hoped that I won’t have to do something similar in India. 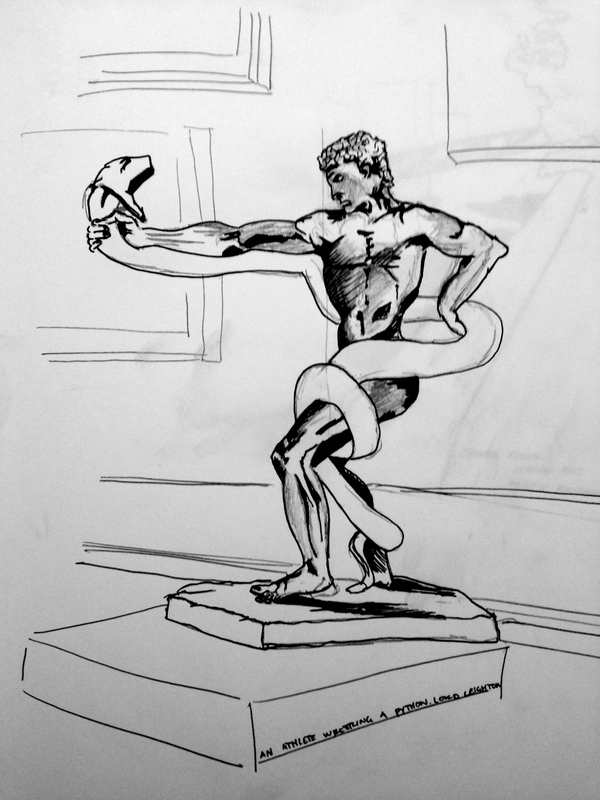 An Athlete Wrestling a Python by Lord Leighton. 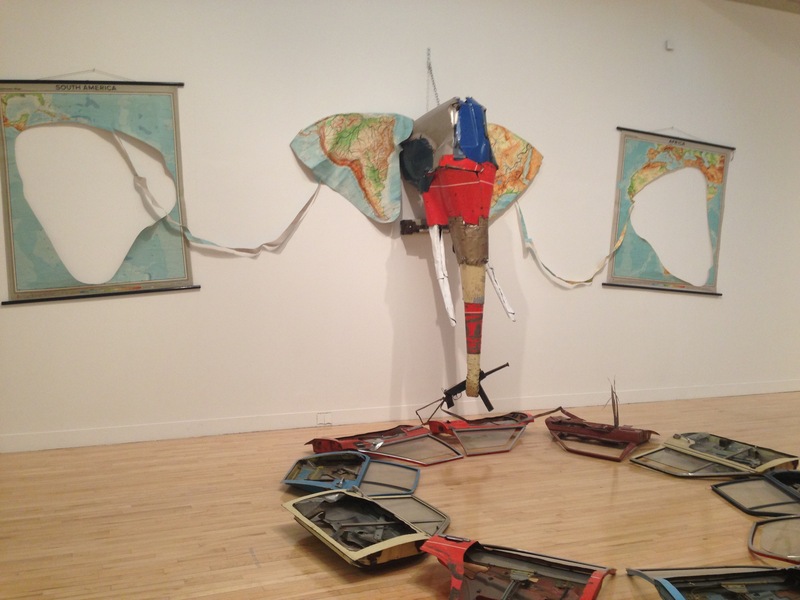 My other favorite pieces in the Tate involved elephants. 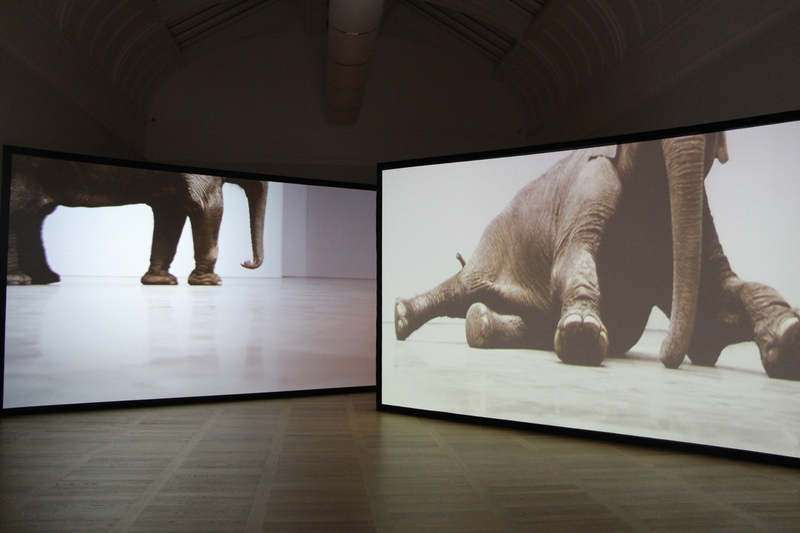 The first was a big room with two screens and on the screens were projections of an elephant in that very same room. I turned the corner and saw an elephant unexpectedly so honestly at first I was pretty scared, especially since I was the only person in the room. Then there was this sculpture made out of old car doors. I dig sculptures made out of re-used materials. Eurostar to Brussels tomorrow. Netherlands on Thursday! More drawings to come soon. Great blog post, with lots of interesting insights. So glad you saw the Lowry exhibit–sounds very interesting. Carry on with your post-grad education. Love you!